Jay Contreras (right) and his bandmates won two major awards in last night's Awit Awards—Album of the Year for Maharot and Song of the Year for their hit single titled "Narda"
The "maharot" band Kamikazee bagged the most number of awards in the 20th Awit Awards last night, August 8, at the NBC Tent, The Fort, Taguig. These include two major awards: Album of the Year for Maharot and Song of the Year for their hit single titled "Narda." Other awards they received were Best Rock ("Narda"), Best Perfomance by a Group Artist ("Narda"), and Music Video of the Year ("Martyr Nyebera"). In the middle of the program, the band kept the audience alive by performing their newest single from the album Maharot, "Seksi Seksi." Jay Contreras, the vocalist, was so energetic that he even had danced with a member of the audience. Another big winner last night was the band Kala, which got four awards. Two of these distinctions were based on their popularity through text votes. A lot of their followers sent text votes for the categories Favorite Group ("Jeepney") and Favorite New Group Artist ("Manila High"). For the major awards, they bagged the titles Best Performance by a New Group Recording Artist and Best World/Alternative/Bossa Music. The Soul Siren Nina received two People's Choice awards—Favorite Song of the Year and Favorite Female Artist—for her song "Someday," which was composed by her former boyfriend, Nyoy Volante. The Best Selling Album of the Year award, which is based solely on the record sales, was given to the album KaminAPO Muna under Universal Records. Meanwhile, the simple design of Sugarfree's Talaarawan got the Best Album Package award. PERFORMERS AND PRESENTORS. The 20th Awit Awards is considered the local counterpart of the US Grammy Awards. Like The Grammys, the awards event at the NBC Tent last night was definitely star-studded. The program started with band performances by Imago, Itchyworms, Sandwich, Spongecola, and Sugarfree. Bamboo and The Dawn also played their popular songs, to the audience's sheer enjoyment. 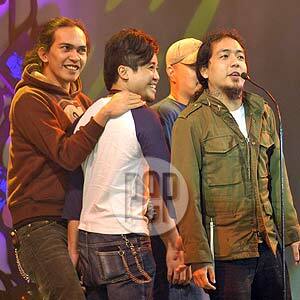 Parokya ni Edgar went freestyle with two well-known rappers, Francis M. and Gloc-9, for the song "Bagsakan." Mr. Pure Energy, Gary Valenciano, danced with his son Gabrielle to the tune of "Shake It Off," which bagged the Best Dance award. Sitti and The Company, the group which got two minor awards during the press night last July 19 , serenaded the people with their bossa nova version of Jose Mari Chan's popular ballad songs. Christian Bautista and Rachelle Ann Go looked completely in love with each other during their duet. Other artists who attended the event to present awards were Ogie Alcasid, Billy Crawford, Raymond Lauchengco, Andrew E., Sheryn Regis, Chris Cayzer, the duo Ariel and Maverick, and director Quark Henares. The rock bands Calla Lily, Chicosci, and Session Road also joined the list of award presentors. To end the program, singer-songwriter Ogie Alcasid and Asia's Songbird Regine Velasquez performed a specially arranged medley, culled from the songs "Kailangan Kita" and "Narito Ako." Best Performance by a Female Recording Artist - Lani Misalucha, "I Live For Your Love"
Best Performance by a Male Recording Artist - Gary Valenciano, "In Another Lifetime"
Best Performance by a Duet - Mon David and Bituin Escalante, "Alone Together"
Best Performance by a New Female Recording Artist - a tie between Sitti and Amber for the song "Para sa Akin" and "Manila," respectively. Best Performance by a New Male Recording Artist - Gian Magdangal, "Himala"
Best R&B - Reuben Laurente and Regine Velasquez, "A Single Soul"
Best Novelty - Jose Manalo and Wally Bayola, "Kring Song"
Best Song Written for Movie/TV/Stage Play - Kitchie Nadal, "Majika"
SPECIAL AWARD. "Dapat 'to matagal na!" Joey "Pepe" Smith said half-jokingly as he received the Dangal ng Musikang Pilipino award in behalf of his band, Juan dela Cruz. His bandmate Wally Gonzalez was just as happy on receiving the coveted trophy, which is shaped like a gong. Their bassist, Mike Hanopol, was unable to join the band in enjoying the honor given by the Philippine Association of the Recording Industry (PARI) because he is currently in the United States. Before receiving the award, Gonzalez, who was the original member of Juan dela Cruz, rocked NBC Tent together with another Pinoy band named Kjwan by playing the band's hit song "Beep Beep." During the performance, the former Juan dela Cruz fret-burner was given a moment to show off his guitar skills. With this, Gonzales proved that he could still keep up with the younger generation of rock bands. After that smoking hot exhibition, Gonzales and Smith played another hit song of Juan dela Cruz, "Himig Natin," which is said to have started the Pinoy rock movement. After their "mini-concert," Smith gave this message to aspiring bands, "Balang araw, kayo din magra-rock and roll!" Aside from honoring Juan dela Cruz, PARI also paid homage to the late King of Philippine Novelty Song, Yoyoy Villame.